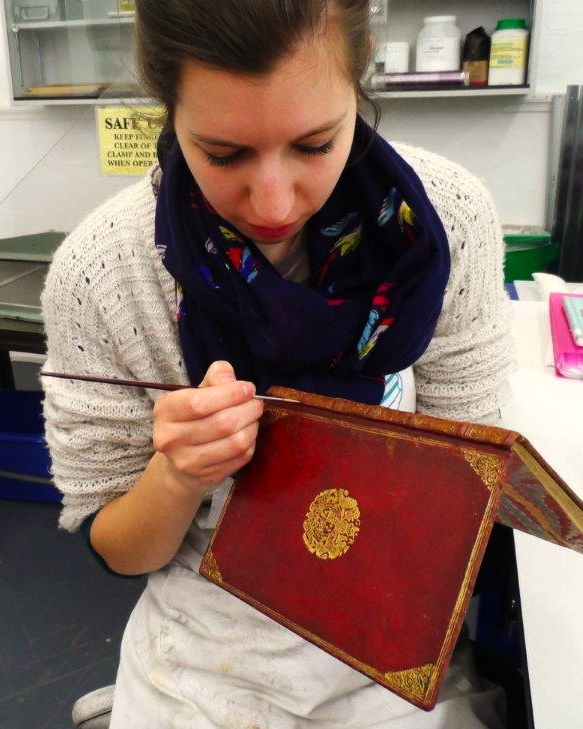 During her final year on the MA course at Camberwell, Emma Nichols covered “a broad range of subjects in paper, book and parchment conservation, intertwined with practical lectures and classes in preservation and conservation science”, which showed her the many aspects of a conservator’s job. Her final project was the conservation of two bindings belonging to the Foundling Museum in London. Once restored, the objects were safely returned to their owners with “concise directions for their future handling and storage”. The Foundling Museum was delighted with the end result and told Emma it plans to display them in ”a special exhibition, demonstrating and showcasing the conservation work they received”. At the end of her course Emma was offered and accepted a job in the conservation studio at Cambridge University Library. She benefitted greatly from the funding from the Anna Plowden Trust and feels that it is thanks to it that she was “able to maximise my learning”.